You're a yoga minimalist, and you don't collect yards of extra equipment when one thing will do for more than one purpose. So, naturally, you're going to carry your rolled-up mat with your yoga strap; why not get double value from that length of webbing and metal loops? It's as simple as child's pose to "assemble." Whether you ride your bike to yoga class, hop on the bus or the subway, schlep there in your sneakers, or grab your gear and sling it into the back of the car, you need to carry your mat. That unwieldy stretch of rubber or PVC travels well enough when it's neatly furled, but how to keep it rolled up when you don't have, or want to carry, a mat bag? The simple solution is to re-purpose your handy yoga strap, the one that makes those seated forward bends and cow face poses so satisfying. A couple of clever loops and you're in business. Use your gear -- mat and strap -- in class and then transform it again for the trip home. You're a genius. Or excessively frugal. But still a genius. Take the buckle or metal hoop end of the mat in one hand and the fabric loop end of the mat in the other. Thread the fabric loop end through both metal hoops. Thread it back through the second -- not the first but the farthest -- hoop or buckle. Pull about half the length of the strap through the hoop/buckle so you are holding a big loop of the strap in one hand and the smaller, fixed fabric loop in the other. Pass the large loop through the smaller loop and pull the strap through until you have a small circle (another loop!) about the circumference of your rolled yoga mat at one end of the strap. Holding the mat-sized loop securely in one hand so it won't shift sizes, grasp the other end of the strap -- the big loop -- about 8 to ten inches from the fold with your other hand. Now poke the mat-sized loop you are holding in place through the loop created when you grasped the other end of the strap. Don't let the mat-sized loop collapse -- keep a good grip on it. Switch hands; use a few fingers to snag the secured loop and transfer it to your other hand. Use your now-free hand to adjust the second loop to mat-size. You should have a stretch of yoga strap with small loops at either end, both just about big enough to slip over the rolled ends of your mat. Slip one loop over one end of your mat and snug it tight. Slip the other loop over the other end of the mat and snug it tight. Done. Hook that mat over your shoulder, or cross-body it over your head if you need to be hands-free or you're riding your bike. Practice this at home a couple of times until you've got it down cold. Then nonchalantly whip a carry strap together after savasana and casually exit the studio, pretending you don't see the admiring glances following your too-cool maneuvers. If written instructions leave you cross-eyed, check the video below to see how easy it is. That's why you practice the move a few times before you take it out. You want to finesse this, not fumble it -- no glory in messing up something so ingenious and simple. A far less elegant and balanced alternative takes even less time. But this one works if your yoga strap has a stitched-down free end with no small loop. Thread the unbuckled end of your yoga strap through both metal hoops on the buckle end to form a loop out of the yoga strap. Double that free end back and tuck it through the second metal hoop (over the first hoop and through the second). Slip the "noose" you create over the rolled yoga mat to position the strap at the center of the mat. Tighten the noose, or loop, securely around the mat. Grab the free end of the strap, sling it over your shoulder and carry your mat. 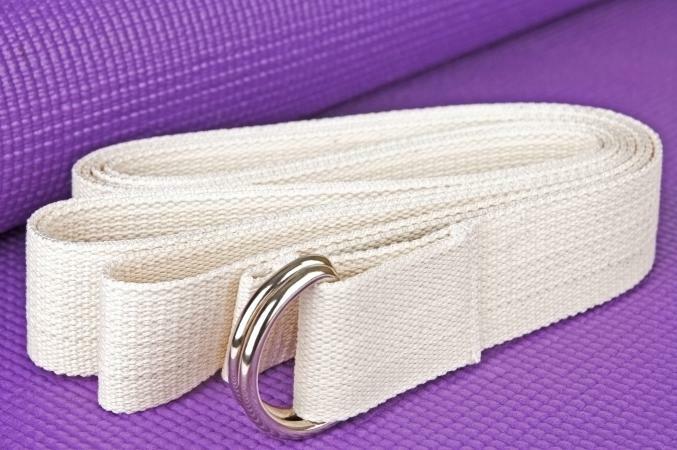 However you decide to collar your rolled mat and truck it back and forth to class, don't ignore the real function of that versatile yoga strap. Use it to help lengthen your hamstrings in reclining leg stretch, work your quads and "arabesque" your back leg higher in natarajasana, and hold full boat for a full count. Then conjure it into a carry strap for your mat because you are a resourceful yogi and your stuff works just as hard as you do.